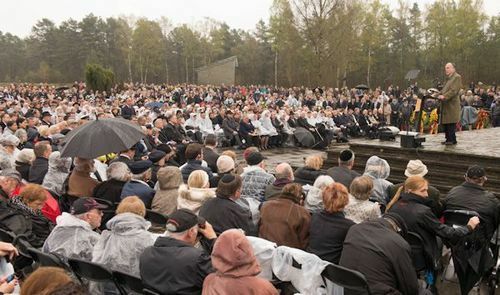 Almost 100 survivors of Bergen-Belsen, as well as children born at the post-war displaced persons (DP) camp at Bergen-Belsen, and British liberators, returned to Lower Saxony to participate in Sunday’s ceremony. Lauder said that there were few countries that didn’t bear some culpability for the crime of the Holocaust and even singled out the United States for shutting its doors “to Jews desperately trying to leave. We know the perpetrators – but they were not just Germans and Austrians. There was complicity in practically every country in Europe,” he said. "We must look to the past to put an end to injustice," said Gauck, speaking at the site of the Nazi internment camp where over 70,000 people were murdered between 1941 and 1945. In his keynote address, German President Joachim Gauck implored those present to do justice to what he called modern Germany's moral duty: "We commit ourselves to the obligation of never denying these crimes, or relativizing them, and of preserving the memories of the victims. 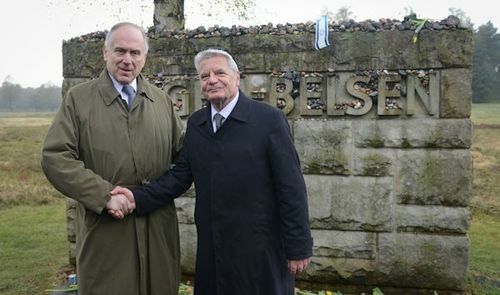 "The British soldiers were the ambassadors of a democratic culture that wasn't bent on avenging the crimes of its enemy, and this helped Germany restore its obligation anew to justice and the dignity of the human being," Gauck said, and he thanked Britain for liberating Bergen-Belsen. During World War II, the concentration camp there became one of the most notorious Nazi camps where more than 50,000 people were murdered. The British 11th Armored Division liberated the camp in April 1945. A Displaced Persons camp – the largest in post-war Germany – was later established nearby. It was closed in September 1950. An estimated 2,000 children were born to Holocaust survivors at the Bergen-Belsen DP camp. We come here today to remember. We remember the evil of this terrible place. We also remember that world silence led to this evil. And we gather with an uncomfortable awareness that anti-Semitism has returned to Europe once again. 70 years ago, as Nazi Germany was collapsing, and the greatest war in history was coming to an end. The saddest irony was that Jews, the people who should have been happiest about Hitler’s defeat, were not to be heard. There were no Jewish victory celebrations like those in New York or Trafalgar Square or Moscow. There was no jubilation. The reason is all around you. For Jews, the awful realization of loss suddenly set in. Mothers and fathers, aunts and uncles, grandparents, friends, over one-million children, all gone. Half of the world’s Jews murdered. Right now, we stand on one of the largest Jewish cemeteries in the world. But there are no gravestones. There are no markers. The victims buried here lost not just their lives the Nazis took their identities as well. When British troops entered the gates here at Bergen-Belsen – they took pictures, and for the first time, the world finally understood the extent of the Nazi horror. We saw the bulldozers pushing naked bodies into open pits. The walking skeletons. The unbelievable sadness and loss. It has always struck me that battle-hardened soldiers, who saw some of the worst combat in Europe, became emotional years later when they talked about entering Bergen-Belsen. 70 years on, we all know about the crime. We know the perpetrators – but they were not just Germans and Austrians. There was complicity in practically every country in Europe. My own country, the United States - the beacon of liberty - shut its doors to Jews desperately trying to leave. When Jews needed help, when they begged for help, all they got was silence. Hitler saw this early on, and he knew he could do whatever he wanted. Even though he told the world exactly what he intended to do. And he said it over and over again. The world was silent. Silence always emboldens tyrants, and the final outcome is all around us today. Since the day that the first British soldiers cut the locks and opened the gates, we have known this story. But there is another story that is not told. I believe it is one of the most important lessons of the Holocaust and no one ever talks about it. After the British troops and international relief organizations began nursing the survivors back to life, Bergen-Belsen became a DP camp, a Displaced Persons Camp. Jews, who had lived for generations in Europe as educated and productive citizens, who were then victims of Nazi genocide, had now become displaced persons. Displaced - what does that even mean? How does a human being become displaced? Jews became displaced persons because no one wanted them. After surviving Hitler’s Final Solution, these Displaced Persons had two options: They could wait for the world to change their situation, or they could change it themselves. They chose the latter. There was no great plan; it was completely spontaneous. It came from within the Jews themselves. First and foremost, Jews never sought revenge. Jews demanded no “Right of Return” to Germany or Austria or Poland or any other European country. They did not teach their children to hate Europeans, or anyone else. They taught their children how to read and to do arithmetic and draw pictures. They wanted, they demanded one thing: that their children lead normal lives. And in spite of everything, they would try to do the same. The first newspaper in the Bergen-Belsen DP camp appeared on 12 July 1945, just two months after liberation. The first book came out in September. If Jews are truly the “People of the Book”, they certainly proved that 70 years ago. Jews immediately moved toward the greatest directive that comes from the Jewish religion: life. They got on with their lives. Mourning gave way to thousands of marriages and new families emerged from the ashes. Can you imagine the courage this took? Think of a young father who lost his wife and small children choosing to move on. Or a young woman who saw her husband and children murdered in front of her choosing to continue. After everything that had happened to them, these people had the courage and the will to start new families. Between 1945 and 1950, when the DP camp closed, 2,000 children were born here. Those children became doctors, lawyers, professors, business leaders. This camp was suddenly transformed from a factory of death to a factory of life, with schools, libraries, small orchestras and not one but two theater companies. There were classes in literature and art and history. These people who had suffered so much these people that no one wanted. This discarded refuse had a secret --- they never saw themselves as discarded refuse. In their minds, they were never displaced. These people had a plan and they had dreams. One of those dreams was a land of their own where they would never again be subject to the whims of others. They would go back to their ancient homeland, the one they dreamed of, and spoke of, for 2,000 years. They walked away from Bergen-Belsen and never looked back. Within five years, these DP camps disappeared. Today, people don’t even know they existed. Because Jews refused to be Displaced Persons, they refused to be victims. There is something else: Jews all over the world helped their fellow Jews get back on their feet. They were never used as political pawns. Much of what happened here was due to the tireless efforts of the Jewish leader of the DP Camp, Josef Rosensaft, who insisted at the outset that the survivors be treated with the utmost respect by their liberators. In 1946, Josef and Dr. Haddassah Rosensaft, a young dentist who helped save 149 children in the terrible winter of 1944-45, were married here. Their son, Menachem Rosensaft, lawyer, scholar and my friend was born right here in 1948 and is here with us today. There is an old Zionist slogan: “If you will it, it is no dream.” Here at Bergen-Belsen, the Jewish victims of Nazi atrocities willed themselves back to life, and it was no dream. From the ashes of this terrible place, the Jewish people rose up and moved on. But tragically, 70 years later, the world is not moving on, it is moving backward. Inconceivably, we appear to be descending into the same, dangerous hell where we found ourselves before. In 2015, we see anti-Semitism rising in Europe. Once again, Anti-Semites twist the truth, they deny the important contributions Jews make to society – any society. The fact is, wherever Jews are allowed to live freely, those countries prosper. Jews win Nobel prizes. Jews cure diseases. Jews build. They don’t tear down! Anti-Semites tear down. Anti-Semites destroy. They create nothing. They save no one. Today, 70 years after this camp was liberated, we hear the same anti-Semitic lies. Today, a Jewish boy wearing a yarmulke cannot walk down the street in Paris or London or Copenhagen without fearing for his life. Right wing neo-Nazi groups are winning seats in Parliament in Hungary and Greece. Iranian leaders repeatedly promise to wipe Israel from the pages of time. 70 years ago, Jews learned the hard way that when someone says they want to kill you, you better take them seriously. We’ve gone down this same road within my lifetime. And we are standing on the result. To be here at Bergen-Belsen and shout against the past while doing nothing about the present is not just wrong, it is outrageous and it is immoral. But there is a big difference between 2015 and the past. Today, there is a vibrant and powerful Jewish State of Israel that has proven again and again its capacity to defend itself and Jews everywhere. And there is a strong and active World Jewish Congress that will not let these threats go unchallenged. To all the people here today who survived: We are all so proud of you. You have upheld the highest traditions of Judaism. Many years ago, you were confronted with the worst things imaginable and you walked out of this terrible place with dignity. The lives you have led are examples the entire world should follow. You have done more than your share. So when you leave this place one last time, know this: There is a younger generation of Jews that are committed to making sure that the Jewish people never fall victim to this kind of evil again. We look up to you and we find inspiration. Just as you never let us down we will not let you down. I will not let you down. That is my solemn promise that I make to you today. We will not let you down.